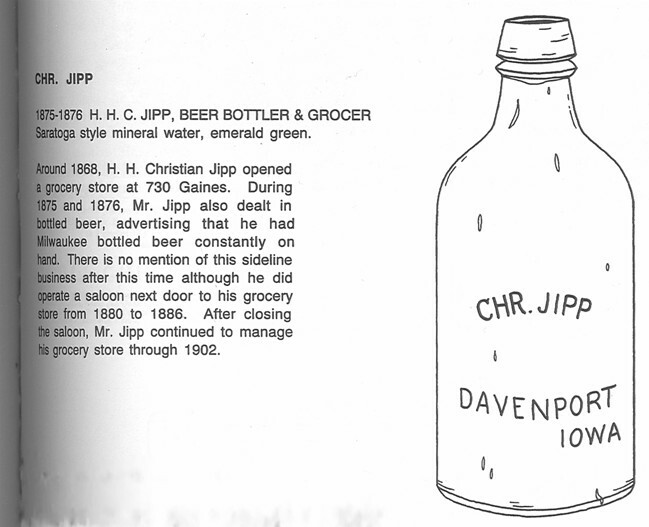 Christian Jipp, an immigrant from Schleswig-Holstein, worked as a clerk at various retail shops along the Mississippi riverfront from 1860 to 1867. In 1868 he built the grocery at 8th and Gaines. This was one of the first retail businesses to progress up the hill from the riverfront on the city’s west side. He and his wife Fanny and their three children Ella, Rhoda and Meta lived in the back of the store for 10 years. In 1878, he added the attached house. After Christian’s death in 1913, the home was owned by his daughter Meta Jipp. The home was divided into two dwellings by 1920, with Meta and a tenant in residence. Various grocers ran the store from 1910 to 1953. By 1940, the home is in the name of Rhoda Jipp, the last surviving member of the original family. She is living there with a tenant. After her death in 1945, the home continued to be two apartments. In 1955 the store is listed in the city directory as Binders antique shop, and in 1956 thru 1958 as Henshaw Upholstering . In 1959 thru 1983 it is listed as various Laundromats. By 1984, the home address and store are listed as vacant. In 1989, after numerous code violations, the city inspection staff recommended the building be demolished. Various plans for use for the structure were proposed, including a beer garden but these plans were never realized. In 1997, the building was purchased by a neighborhood organization with the goal of obtaining grants to rehabilitate the structure. These plans also went unrealized. By 2004, deterioration on the west side caused an interior brick wall to collapse. The building rose to #1 on the city’s demolition list. That same year, Gateway Redevelopment Group launched a fund drive to save the building. Using donations of cash from neighbors and supporters, the professional expertise of neighbors and area contractors, grants from RDA and the State Historical Society of Iowa, and thousands of hours of volunteer labor, the building was saved to become the offices of GRG, the home of their Architectural Rescue Shop, a caretaker apartment and the Hamburg historic Resource Center. 1833 - Christian Jipp was born in Holstein region of the German confederation. 1835 - Fanny was born in Holstein region of the German confederation. April 23,1857 - Christian arrives on board the steamship Howard from Hamburg to New York. Destination listed as Davenport. 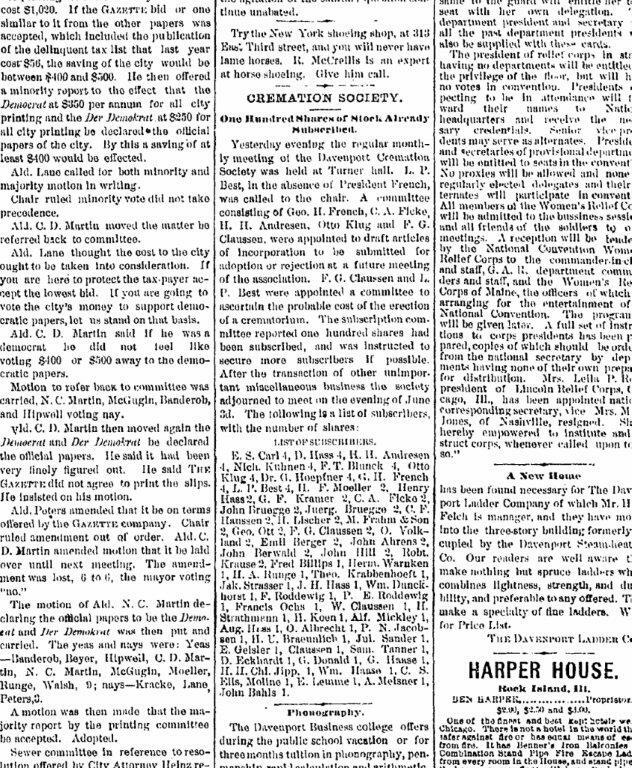 1870 - Family listed in the Davenport census - Christian, Fanny, Meta, Ella, Rhoda and a domestic servant Cristina Rolf in household. March 10, 1913 - Christian Jipp dies. Is buried in Oakdale Cemetery.